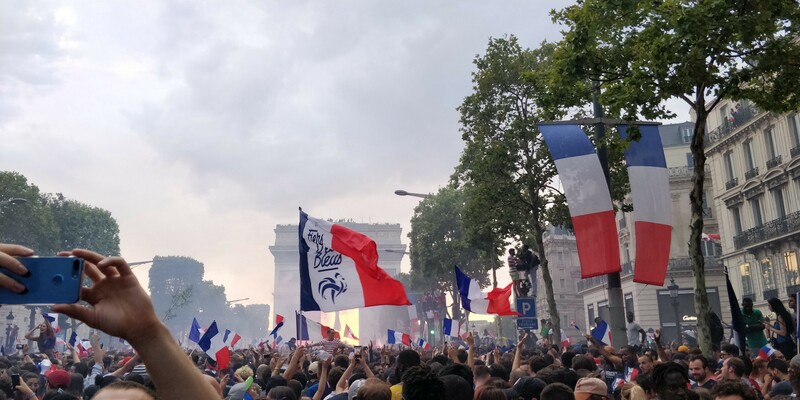 What France’s World Cup win meant to me? NO, it’s not just about Football. Being such a huge football fan and experiencing France win the worldcup in Paris would ofcourse be a story to tell my grandchildren, but there is something more to this. I am being completely honest here. I never rooted for France to win the world cup, not until the very end — the Semi-finals. Yes, living in Paris surrounded by the French, I was probably the only Argentine fan. You would not understand how difficult it was for me to see my idol unhappy again. But nevertheless, this post is not about him but about what it meant to me to be in France during the world cup. I was definitely kicking GOOOOOOAAALLLS of my own when the stars aligned to be in Paris just in time for the FIFA World Cup final. To witness the passion and raw emotions on people’s faces when their team wins (or loses) is just so intense and exciting at the same time. I was lucky enough to celebrate victories with two nations, Croatia (for their Quarter Final win against Russia) and of course France. When you think about it, it is crazy to think the talents and actions of 22 almost superhuman men and one ball on a pitch can unite the masses together in such a remarkable way. I clearly remember, last time the FIFA World Cup came around, I was preparing for my engineering entrance examinations and it was tough for me to watch every match (because studies were the priority, then). But the best thing that happened was my cousin coming home, and hence I was able to watch the knockout matches with him. I clearly remember that the matches used to be quite late, but it was so much fun. I watched that epic FIFA semifinal game where host country Brazil faced that humiliating semi-final defeat against Germany, possibly the most cringe-worthy game I have ever watched. 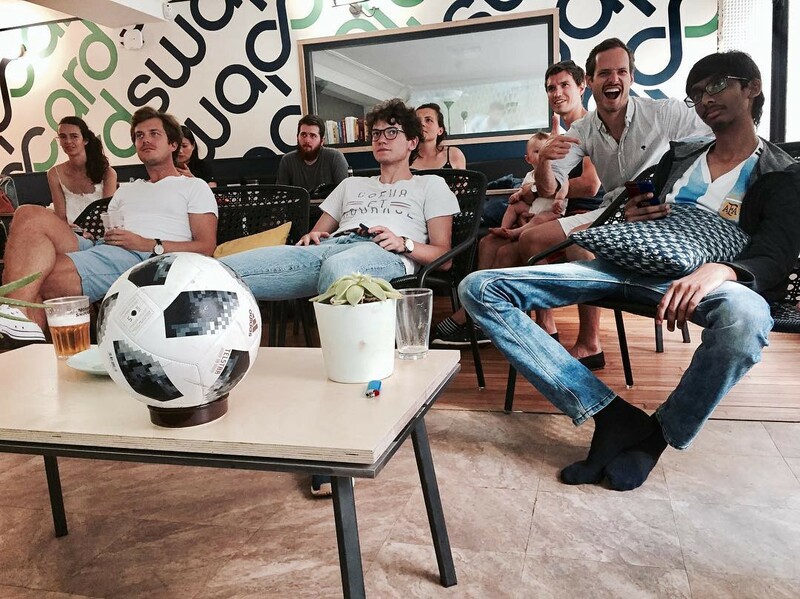 But watching the 2014 FIFA World Cup final was very very unusual. I was shattered and I couldn’t believe that why GOD be so tough sometimes. Like WHYYY? Fast forward to 2018 and let’s replace the Germans with their European counterpart, the French. I was so lucky to be invited by my Parisian friends Jasmine and Charles for watching the finals with their French friends. We went to an amazing bar and restaurant-filled plaza that was completely brimming with people. Many bars had set up extra screens outside and DIY platforms making IKEA furniture look like the stuff of luxury. If we were, to be honest with ourselves, none of these questionable makeshift furniture pieces was ever going to make it past the match. Hundreds upon hundreds lined the bar to watch the game on whatever screen they could. The first goal scored was unbelievable with the atmosphere amongst the crowd euphoric. It was almost as if this was going to be the French Revolution 2.0 with the amount of excitement in the air. People chanting, jumping up and down and singing in French for over 90 minutes was remarkable. After the final whistle, all things were a riot as it was party time in Paris. 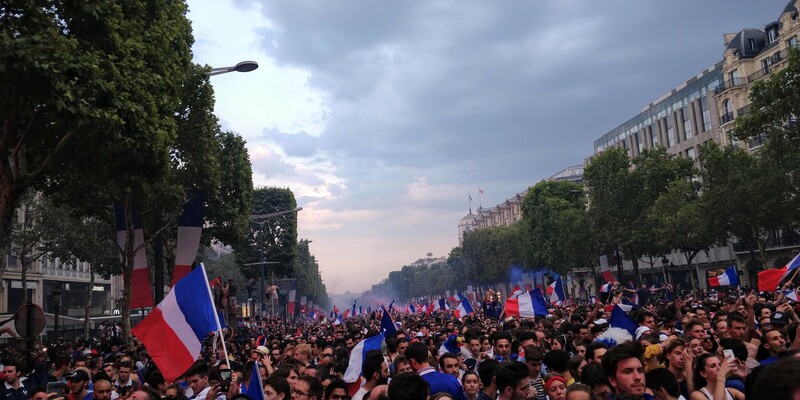 The excitement of seeing the French FIFA World Cup win literally took some people to new heights with some opting to climb trees, bus stops, or even random shops to continue their celebrations. As a result, there were also other just as jubilant people mountaineering cars to suss out the street party below. We started walking through the main street with people going crazy left, right and center. We were all marching on for an epic win. People banged on car windows as they sailed right through the crowd on the street. Horns, beeps, whistles, and chants were the new music to all. People even got out of cars, popped out of their sunroofs to dance and wave the French flag around. Some drivers even encouraged others to jump on their car bonnet to get in on the action. The epic one street march across Paris ended up at Champs-Élysées. By this stage, it was dark and it seemed like the whole of Paris was slowly coming together at this central point. Further to the street party going on below at Arc de Triomphe seemed to have been converted into France’s Mount Everest with people making their way to climb it. There were drums banging and fireworks being shot into the air. The crowd was chanting non-stop. I had never experienced anything like it. A city in full party mode with really flexing their liberties doing almost anything. Some eccentric people were climbing on cars, peeing near cars, and standing on scooters whilst riding through the city. But what stuck with me in this world cup winning nation were the people. Appearances are deceptive and you know what, it hardly matters in the France that I have experienced. 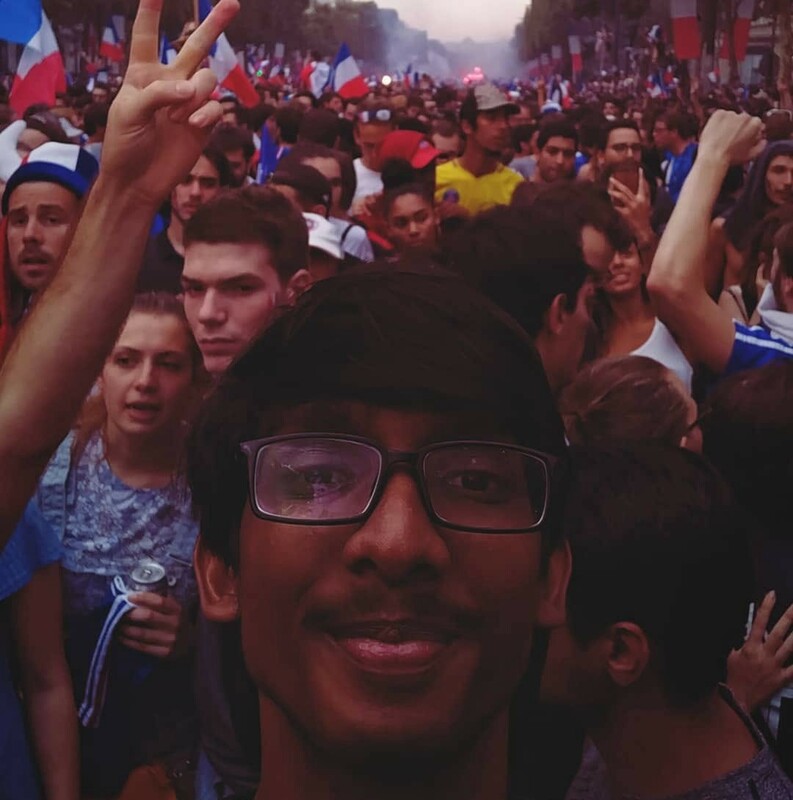 I was an Indian living and working in France. I have light-brown skin, dark hair, and may not fit into the stereotype of a French male but the kind of togetherness I received was inexpressible. I never heard or seen any discrimination, verbally or otherwise, towards me during my stay there. So from my own experience, it is hard to say there is a climate of resistance against immigrants which stops them from developing into successful individuals in the society, and this World Cup victory is exactly a symbol for that. Of course, there are people who do not like immigrants probably because it decreases the “Frenchness” of French culture. The integral way in which football or, sports in general, is part of the French society has acted as a bridge — opening people up to understand the culture, composition, and evolution of other countries and societies and assimilating the best of everything. If my biography ever gets written, this day would surely gonna be a chapter. Nevertheless, this was one of the most special, super wild and one epic win I would never forget. Vive La France!